Astronomical Data Analysis Software and Systems (ADASS XVIII), which was held on 2--5 November in Québec City, QC, Canada. The meeting was hosted by the National Research Council of Canada, Université de Montréal and Université Laval. The first event of the conference was a lively tutorial exploring the technologies behind Google Sky and Microsoft's World Wide Telescope. This tutorial set the stage for an exciting week of talks, discussions and demonstrations on the development and use of cutting edge technologies in astronomy, which are summarized in this volume. The main themes for the ADASS XVIII conference -- Astronomical Algorithms, Future Large Projects, Software Engineering in Astronomy, and Web Technologies -- were thoroughly covered by the 46 oral and 115 poster presentations; most are included in this proceedings volume. In addition, 10 floor demos and 6 focus demos in the main hall gave many the opportunity to see the latest tools and technologies in action. 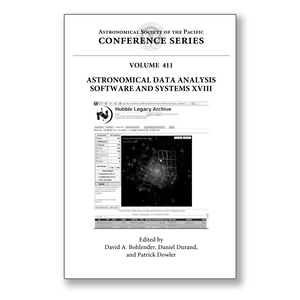 This volume will be of great interest to astronomers and software developers who would benefit from an overview of the multiple data-related challenges faced by actual astronomical projects including the Dark Energy missions, the GAIA satellite project, the Large Synoptic Survey Telescope (which will generate terabytes of data daily), and the Virtual Observatory (VO), with its many standards and services. The contributions also make detailed recommendations for the solving of these problems. Many of these same problems and solutions will be of interest to those working in other areas of scientific research that deal with complex instrumentation or very large quantities of data.